Shomer Shekalim specializes in assisting עצמאים with their pensions and insurance. This is a link to a calculator from beinleumi that calculates how much you can put aside for a keren pensia and keren hishtalmut and the subsequent tax breaks you’ll receive. To be clear: a זיכוי is a credit which means 35% of it is money back in your pocket. 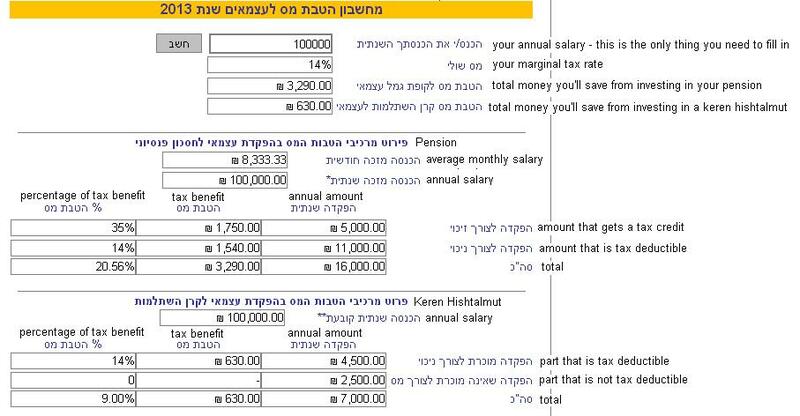 ניכוי means a tax deduction, which means that it is as if you never made that money for the purposes of your paying taxes. The calculator is for 2013 since there were not changes in the amounts and tax brackets in 2014. For your convenience, I translated the calculator in the image here (click to enlarge). If you would like assistance with any of these, please call me at 052-790-6824 or e-mail me at jonnydegani@gmail.com.